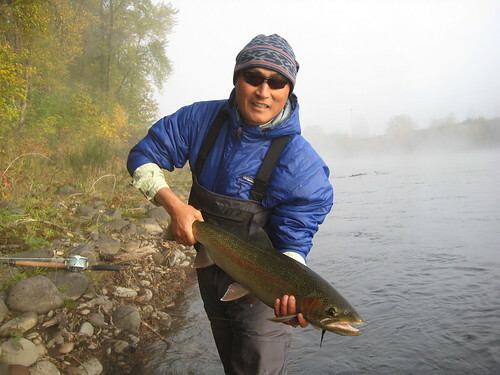 While I still do a good deal of trout fishing this time of year, the steelhead fishing, for me, is more compelling. 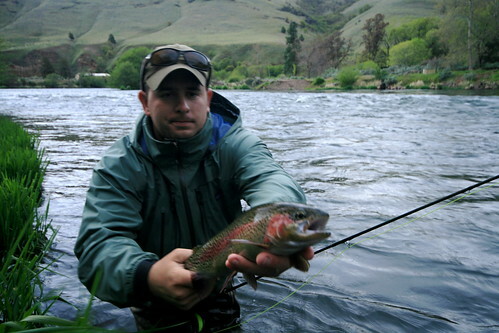 The Fall is the most productive time to flyfish for summer steelhead. While low-water conditions persist, the fish chase swung flies better than they do at any other time of year. 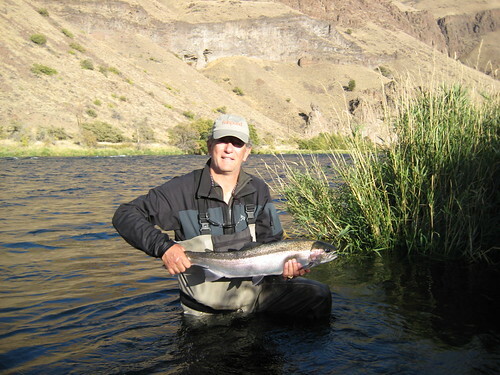 The Deschutes has had a great return of summer steelhead this year, with a good proportion of wild fish. The fishing there was very good throughout late September and early October. 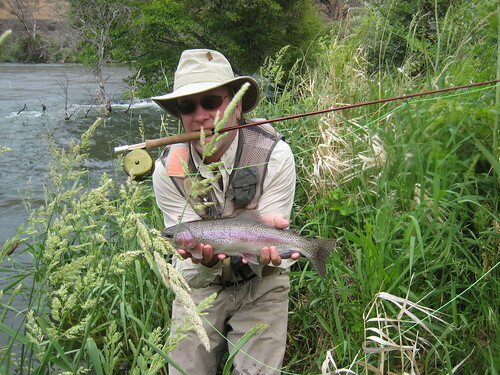 More recently the flow jumped up to 4720 cfs which moved the fish around and made them less willing to bite. As conditions stabillize this week the fishing should rebound. 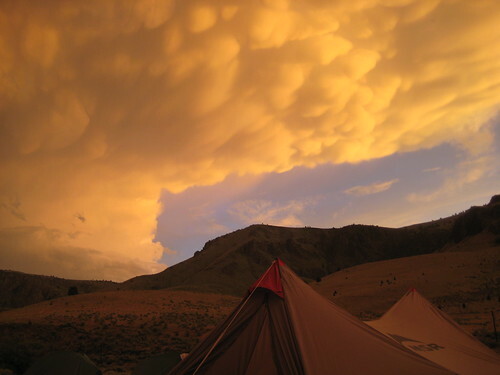 The desert is a magical setting: rim rock canyons, green hillsides, yellowing alders and flaming poplars. Traffic on the Deschutes has been down this year. Blame it on the economy, it might be bad for business, but I don’t miss the crowds. 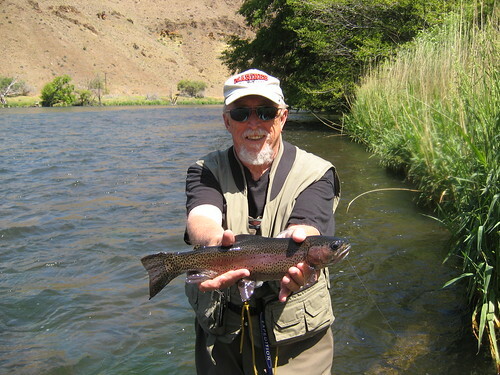 We have done several multi-day trips on the Trout Creek to Maupin section in the last couple of weeks and found very good fishing. On cloudy days and in low-light conditions, I have been doing well on traditional wet flies like a Purple Peril or Silver Hilton (#4-#6). When the sun is on the water, the fish have been responding to leech patterns swung on a type III sink-tip line. Fall is a magical time of year, but we all know it will be over soon. Now is the time to get out and enjoy the mild weather before the rains come for good. We just arrived back in Eugene from a week-long stint on the Deschutes. We did a four day trip followed by a three day trip. We had great weather, great groups of guests, and the fishing ranged from good to outstanding. The dry fly fishing was good enough that we did very little nymphing. The salmonflies and golden stones were out in force up and down the river. We had warm weather, which makes the bugs more active, and some of the most exciting fishing happened when we had some wind blowing; in effect chumming the water for us with naturals. Top producing patterns were the Norm Woods’ Special and Clark’s Stone (#6-#8), though other patterns work as well. 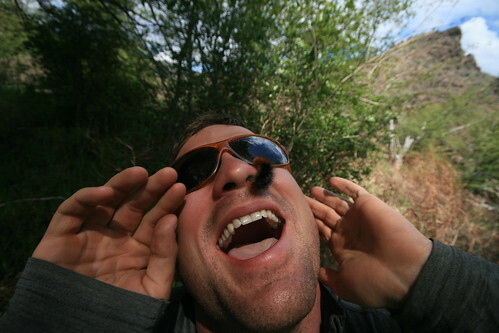 When some anglers hit the Deschutes this time of year, they come armed with legions of stonefly patterns the size of badminton birdies. With the exception of very fast-water spots, I almost always do better with smaller, somewhat more drab imitations. 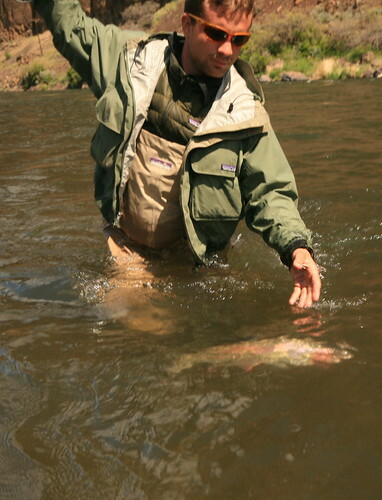 If you are heading for the Deschutes this week, bring a few Green Drakes as well, I saw a couple naturals, but we didn’t really have the weather for the hatch to pop. If you happen to be in the right place at the right time on the Lower Deschutes, the Green Drake hatch can be some of the most exciting dry fly fishing of the year. The Golden Stone and Salmonfly hatch should linger on the upper reaches until past the middle of the month. 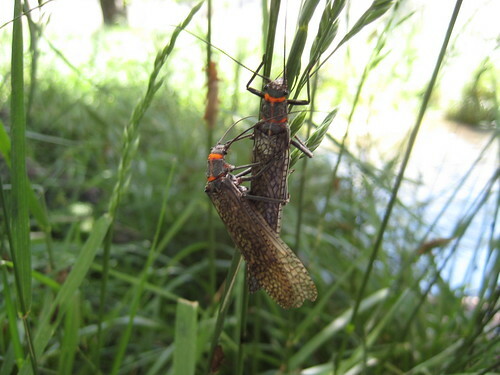 Later on in June and throughout the summer, dense hatches of small caddises and mayflies will become the most important items on the menu for the Deschutes Redsides. 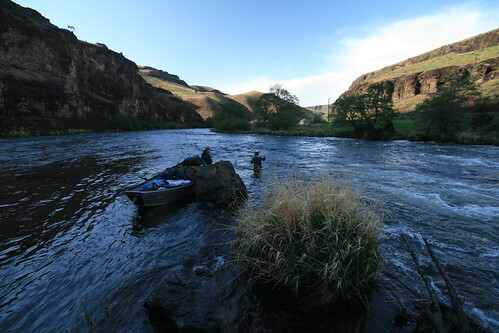 We still have some availability for the rest of the summer and fall if anyone out there is interested in an outfitted and guided trip down the Deschutes. 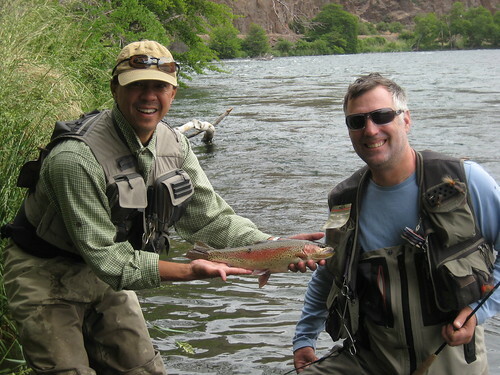 All the guides we work with have over a decade of experience guiding fishermen on the Lower Deschutes. 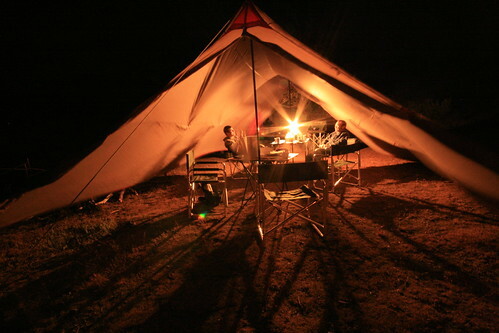 The camp features lots of creature comforts and amenities and gourmet food. The trip is hard to beat. 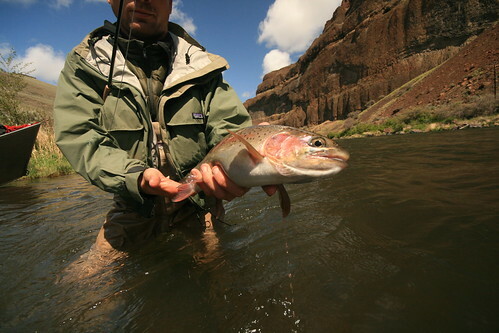 What really makes the Deschutes incredible, however, are the fish, the setting, and the hatches. 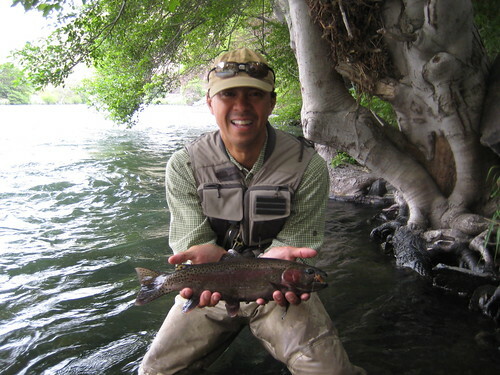 If you have not done so already, you owe it to yourself to experience Oregon’s finest trout stream.